Alpharetta, Georgia – November 18, 2018 – P.TEN MARKETING (P.TEN) is proud to announce the launch of the all-new ProTorque.com mobile-friendly website with eCommerce for ProTorque Performance Products. Headquartered in Medford, New York, ProTorque Performance Products is a manufacturer of high-performance and replacement torque converters that are used in many of the world’s quickest and fastest record-setting racecars. ProTorque entrusted P.TEN to develop a new, modern website to replace their existing online presence. P.TEN worked closely with ProTorque to launch an industry-leading online store where customers can select and purchase torque converters quickly and easily. Intuitive menu structures and easy-to-follow navigation makes finding the right converter a painless process, and critical product performance factors are all displayed clearly. Technical information is paramount on the new website, and racers can submit their achievements to be featured online. P.TEN also created a customized form which allows customers to input their vehicle’s specs so as to have ProTorque put together a custom-built torque converter that’s unique to their specific application. For those wanting an off-the-shelf unit, an interactive locator map allows visitors to find a ProTorque dealer near them. Being accessible from mobile devices was also a critical component of the build, and the new ProTorque.com site functions flawlessly on desktops, tablets, and smartphones while still preserving eCommerce capabilities. 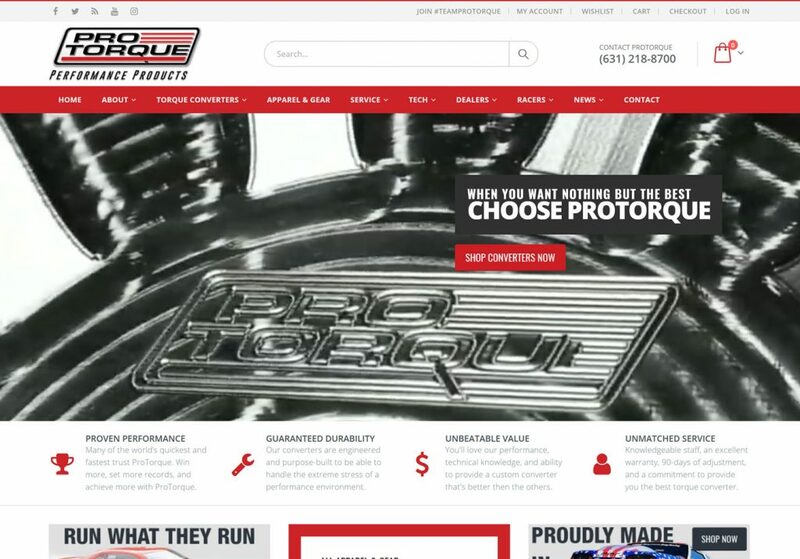 Additionally, the old website, which was not mobile-friendly and did not offer online sales functionality, contained a vast repository of ProTorque’s company history and important drag racing news. While developing the new website, P.TEN took care to make sure that every piece of content was transferred from the old site to the new one, so as to ensure that none of ProTorque’s impressive heritage was lost. Now in its sixth year, P.TEN Marketing continues to expand its product offerings for its list of top-tier motorsports manufacturers and race teams. For those interested in partnering with P.TEN for marketing services, including website development, please visit www.PTENmarketing.com or call (646) 820-PTEN. ProTorque Performance Products is committed to exceeding the needs of the high-performance market by providing innovative and record-setting torque converter products. With a full manufacturing facility, in-house research and development, and worldwide marketing and sales capabilities, ProTorque Performance Products’ unsurpassed quality has inspired phenomenal growth and customer loyalty. Learn more at www.ProTorque.com and LIKE ProTorque on Facebook at facebook.com/ProTorque. Established in 2012 by industry expert Ainsley Jacobs, P.TEN Marketing specializes in marketing, PR, creative and graphic design, website development, print media production, and support services for the automotive and aftermarket communities. By mixing a passion for motorsports with traditional marketing expertise, P.TEN’s staff assists manufacturers, race teams, and facilities to streamline their marketing and branding efforts. Learn more at www.PTENmarketing.com and LIKE P.TEN on Facebook at facebook.com/PTENmarketing.